I have kind of a funny story to go with this salad. I don’t know if you saw my Calgary recap post, but we ate many, many wonderful but non-healthy things. When I got back from Calgary on Monday night, my body was crying for some vegetables. I roasted some sweet potato and threw together this lovely and hearty salad. I put a picture of it on Instagram and didn’t give it a second thought. I don’t know why, but I wasn’t really thinking it was something I would post on the blog. The next morning, I saw a comment on the picture from a good friend asking me to hurry up and post the recipe. She told me her sweet potato was already cut and everything. Well then! I decided that if it looked good enough to make her cut up a sweet potato in advance it may also be good enough to share with you all. I saw a roasted sweet potato salad at a salad bar in Toronto and it really is a great idea. The warm, crispy roasted sweet potato contrasts great with the crunchy cabbage and carrot. I added feta because I thought a stronger cheese would hold up well and it did. I also used a big dollop of hummus as dressing, something I often do. I like how creamy it makes a salad while also adding some protein. I loved it and thought it was a great change of pace from my usual salads. Hurry and get your sweet potato cut up so you can try this one out! Toss sweet potato cubes in olive oil and spread them across the baking sheet evenly. Bake for 20-25 minutes or so, turning halfway through. Once they are cooked to your liking, toss with a light sprinkling of seasoning salt and set aside. Divide the spinach between two plates and sprinkle each with the divided coleslaw mix. 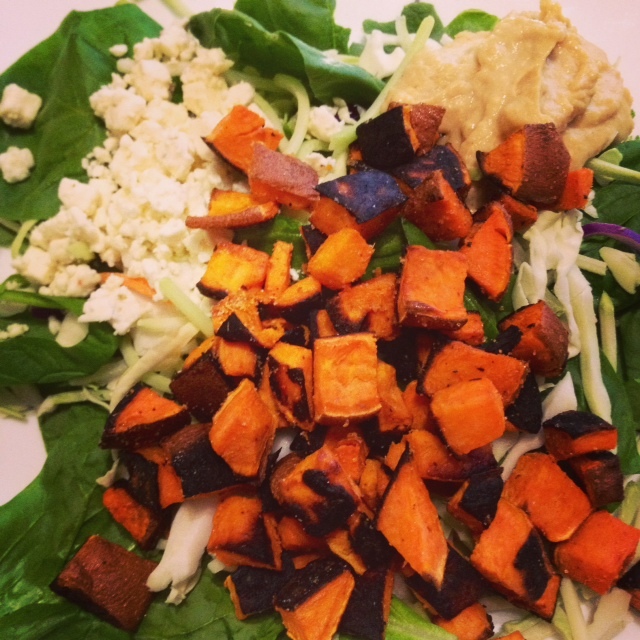 Top each salad with the warm sweet potato and feta cheese and dollop the hummus on each. Serve!